The New England Congregationalists trace their roots to the Pilgrims of Plymouth and the early settlers of Massachusetts Bay. These people sought to worship God directly, and to govern their own affairs – hence the term “Congregational”, which means that the people of the local church are responsible for the church. The United Church of Christ is a nationwide denomination of 1.2 million members, the largest protestant denomination in Maine and has world-wide missions in ministry, health care and public health, social services, and education. 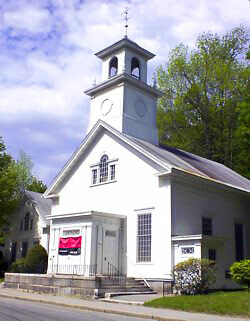 The colonial structure with its white steeple has long been a landmark on Wilton’s Main Street. But the birth of the church took place in a private home, Feb. 19, 1818. There were several factors which contributed to its formation: the dominant influence of Congregationalism, which had been brought by the Puritans to Massachusetts, Maine’s parent state; the missionary effort of Rev. Jotham Sewall of Chesterville, which resulted in the organization of most of the Congregational churches in Franklin County. For whatever the reason on that February day in 1818, Mr. Sewall and three other members of the Chesterville Church met at Benjamin Eaton’s home to examine eight candidates. These eight candidates, having given “satisfaction to those who examined and to each other of their qualifications for enjoying gospel ordinances, were embodied into the Congregational Church of Wilton.” The candidates were John Flanders, Sarah Flanders, his wife, Silas Gould, Sylvester Strickland, Elisha Bass, John Barker, Phoebe Barker, his wife, and Rosanna Eaton. Among other things, the charter members voted to hold monthly conferences, later held once every two months, and these formed an important part of the church life until the end of the 19th century. Preaching services were held irregularly during the early years of the church. Among early preachers was Rev. Jotham Sewall, who preached every other Sunday for a year, for the sum of $58.50. In 1832, when the church had 31 members, Rev. Samuel Talbot became the first full-time minister, staying in Wilton for more than 10 years. For this, he received $200 a year, one-half of which was paid by Elisha Bass, one of the first deacons of the church. 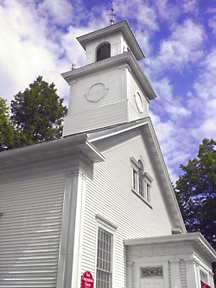 For a long time, church services were held at members’ homes or in the schoolhouse, and later in the Old White Meeting House, which was built in 1829 by the joint efforts of the Baptists, Congregationalists, and Universalists. This building later became Wilton Academy. In the early 1850’s, the Congregationalists began to talk of a place of worship of their own, nearer the center of town, one reason being the difficulty of attending worship during the winter months due to the bleak location of the Meeting House on top of a hill. Consequently, Walker’s Hall came to be used as a permanent place of worship until 1857, when the first home of the Congregationalists was constructed on the site of the present’ church. Part of the expense was raised by selling pews to individual members. The cost was about $2,000. In March 1869, during the pastorate of Rev. Jonas Burnham, the “great disaster” occurred, when the weight of snow on the roof caused the building to collapse. Thankfulness was felt that the accident had not occurred the previous day, when a Sunday School concert had been held with many children and adults present. A movement was started to solicit funds for the building of a new church. Although materials were scarce, since it was so soon after the Civil War the new church was completed in a year. This is the present structure with the addition of a vestry, later. The vestry was added to the north side of the church in 1882, given by the children of Deacon Seth Bass and his wife, Nancy. This increased facilities for the Sabbath School and the church’s social activities. About 10 years later, a new church organ was purchased. Also, the church, which up to this time had received aid from the Maine Missionary Society, became self-supporting. As years passed, it was felt that the church building should be remodeled and enlarged, and in 1908, during the pastorate of Rev. Willard Palmer, this was accomplished. Through contributions, about $5,000 was raised and a Mr. Bourne of Boston was hired as architect. The remodeled church and present vestry, which was built on the south side of the church, were dedicated in 1909. The old vestry was sold and moved up Bass Hill, where it was made into the home presently owned by Mr. and Mrs. Morton Shepherd. With pledges by individual members and by efforts of societies of the church, especially the Golden Rule Circle, the debt was paid off in three years. Two years after the remodeling of the church, the church was incorporated. In 1914, the parsonage on Village View Street was purchased. Early records state that the Golden Rule Circle played an important part in the movement to buy this. The church celebrated its centennial year in 1918 with a three-day observance, including an interesting pageant written by Rev. Mr. Palmer, Misses Mary and Lizzie Bass, and Willard S. Bass. In 1920, a pipe-organ was installed, and in 1946, additional stops were added in memory of Harriett C. Bass, organist for 17 years. New Church School rooms were dedicated in Sept. 1928, the second story of the vestry being finished off into six new classrooms. Rev. Albert P. Watson began his pastorate of 12.5 years in 1929. Both he and his wife were greatly loved. His magnetic way with young people also calls to mind the fact that no history of the church would be complete without a reference to Willard S. Bass, well-loved superintendent of the Sunday School from 1909 until his death in 1956. Ministers who followed Mr. Watson were Rev. Leon Dickinson, Harland Lewis, John Webster, Daniel Leavitt, and John Ames. In 1949, increased enrollment in the Church School made more classrooms mandatory. Excavation under the church, with classrooms in the basement, seemed the only sensible solution. Work began in January, 1949, with practically all volunteer labor, and More than 100 men, under the direction of Oscar Chandler, worked for- nearly a year. Eventually, a large room designated Chandler Chapel and six classrooms with storage closets were finished. A new downstairs kitchen was added to the back of the Parish House in 1956. In 1958, due to extensive soot damage, the church had to be renovated and redecorated. The result was the present beautiful house of worship with its sanctuary, parlor, vestry, study, and Sunday School rooms. History was made in 1957, when two great denominations, the Congregational-Christian and Evangelical and Reformed, merged to form the United Church of Christ. The Wilton Church voted approval of this merger in October of 1960. Two church organizations’ deserve mention. There has always been a young people’s group, since Rev. Frederic Newport organized the Young People’s Society of Christian Endeavor in the late 1880’s. Today, there are Senior and Junior Pilgrim Fellowship, both of which have active projects in church, community, and missionary work. The Ladies’ Circle, which began nearly as soon as the church did, became the Golden Rule Circle. Several women’s organizations, including the L.H.N. and the “World Service Group”, were active over the years. with the Women’s Fellowship incorporating most of these today. Physically, the church building itself has of course changed many times since its beginning. But the “significance of a church lies not in the building but in the body of people who make up the church.” Certainly any church at any period of time faces continuing challenges. We feel that the inspiration and faith which made the first church a reality will not fail to meet today’s challenge. 1620 – Pilgrims seek spiritual freedom, the forebears of the UCC leave Europe for the New World latter generations know them as the Pilgrims. 1630 – In an early experiment in democracy each Congregational church is self governing and elects it’s own minister. 1636 – To advance and perpetuate learning Congregationalists establish both Harvard and Yale and eight historically black colleges and universities in the South. Schools that continue today as places of nurture and liberation for children of this generation. Nationally 47 schools are members of the UCC Council for higher education today. 1640 – Beginning of freedom of the press. The idea of a “free press” in North America begins with the Pilgrim Press which is the oldest publishing house in the U.S.
1700– An early stand against slavery, Congregationalists are among the first Americans to take a stand against slavery. The Rev Samuel Sewall writes the first anti-slavery pamphlet in America and lays the foundation for the abolitionist movement. 1773 – First act of civil disobedience five thousand angry colonists gather in the Old South Meeting house to demand repeal of an unjust tax on tea; inspiring the “Boston Tea Party”. 1773– Phillis Wheatley a member of Old South Congregation becomes the first published African American author with “Poems on Various Subjects” and is a sensation. 1777 – Old Zion Reformed church in Allentown saves the Liberty Bell from being melted down by the British by hiding it in the floorboards of the church. 1785 – Lemuel Haynes is the first African American ordained by a Protestant denomination. He becomes a world-renowned preacher and writer. 1839– Enslaved Africans seize control of the schooner Amistad but their freedom is short-lived and they are held in a Connecticut jail. Congregationalists organize to free the prisoners. The Supreme Court rules the captives are not property, and the Africans regain their freedom. 1840– First united church in U.S. history is formed by uniting the Lutheran and Reformed forming the Evangelical Synod. The Evangelicals believe in tradition but also in spiritual freedom, ” Rigid ceremony and strong condemnation of others are terrible things to me” one of them writes. 1846– The Amistad case spurs the conscience of Christians who believe no human being should be a slave. Lewis Tappan organizes the American Missionary Association, the first anti-slavery society in the U.S. uniting Congregationalists, Presbyterians, Methodists and other Christians. 1853 – Antoinette Brown is the first woman since New Testament times to be ordained as a Christian minister and elected to lead a Congregation. 1862-1877– The American Missionary Association founds six colleges, Dillard, Fisk, LeMoyne-Owen, Huston-Tillotson, Talladega, and Tougaloo all historically black colleges. 1897 – Congregationalist Washington Gladden is one of the first leaders of the Social Gospel movement which takes literally the commandment of Jesus to “love your brother as yourself”. 1943 – Evangelical and Reformed theologian Reinhold Niebuhr preaches a sermon that introduces the now famous Serenity Prayer; “God, give us grace to accept with serenity the things that cannot be changed, courage to change the things that should be changed, and the wisdom to distinguish the one from the other”. 1957 – The United Church of Christ is born when the Evangelical and Reformed Church unites with the Congregational Christian Churches. The new community embraces a rich variety of spiritual traditions and embraces believers of many nationalities and races. 1959 – Southern television stations impose a news blackout on the growing civil rights movement, and Martin Luther King asks the UCC to intervene. The UCC organizes churches and wins in Federal court a ruling that the airwaves are public not private property leading to a proliferation of people of color in TV and newsrooms. 1972– The UCC’s Golden Gate Association ordains the first openly gay person in history as a Christian minister, The Rev. William R. Johnson. The ordination of the first lesbian minister soon follows. In the following three decades, General Synods urge equal rights for homosexual citizens and calls on congregations to welcome gay, lesbian, bisexual, trans gender members. 1973– The UCC General Synod becomes impassioned about the plight of farm workers from Cesar Chavez and flies delegates to Coachella Valley to show support. 1976 – General Synod elects the Rev. Joseph H. Evans president of the United Church of Christ. He becomes the first African American leader of a racially integrated mainline church in the U.S.